The Human brain is the most complex organ in entire body. It is the command center of your nervous system. The Central Nervous system and the Peripheral Nervous System control every small task of your daily life, from blinking an eye to breathing in. Your brain receives inputs from sense organs and sends output to the muscles. The structure of the human brain is somewhat similar to the brain structure of other mammals. Forebrain: – This part is at the very top of the brain. It consists of the cerebrum, thalamus and hypothalamus. Midbrain: – the mid brain is responsible for various things like hearing, vision, alertness, temperature control etc. This part consists of the tectum and tegmentum. It becomes part of the brain stem. Hind brain or Brain Stem: – This part consists of the medulla, cerebellum and pons. Brain stem is located in the rear and bottom of the human brain. It connects the brain to the spinal cord. Cerebrum: – It is the largest structure of human brain and makes about 2/3 of the entire mass of the brain. This part is divided in to two sides – the left and right hemispheres. Left section is called left brain and right one is called right brain. Long neuron branches called corpus callosum connects both the hemispheres. Limbic System: – This part is also known as emotional brain. It is located within the cerebrum. Cerebellum: – It is also known as little brain. This part is responsible for regulation and co-ordination of movement, balance and posture. Amygdala: – This part is located in the center of the limbic system. It is responsible for alerts of basic survival need and emotional reactions. Declan, Tobin. " Fun Facts for Kids about Structure and Functionality of Human Brain ." Easy Science for Kids, Apr 2019. Web. 21 Apr 2019. 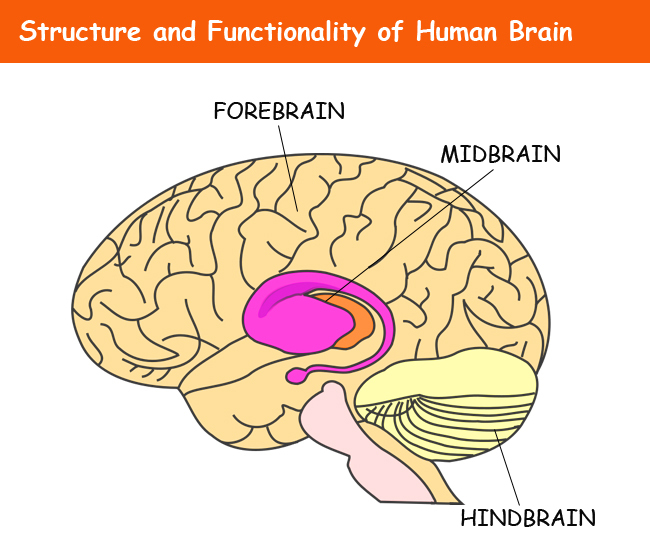 < https://easyscienceforkids.com/structure-and-functionality-of-human-brain/ >.